Instructions: This is an 8 inches by 8 inches top folding card. To make the card base, cut two pieces of card stock measuring 8 inches by 8 inches and another 8 inches by 8 1/2 inches. Score the second piece at 1/2-inch mark and fold. 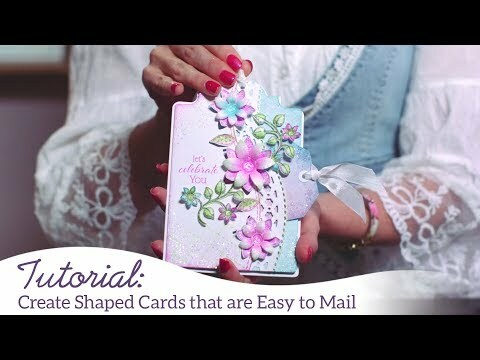 Apply glue on the inside flap and place the first piece on it to make the card base. Cut a pattern paper from the paper collection a little smaller than the card base and adhere to the card front. Cut another piece of pattern paper matching the design shown on the card, distress the edges with paper distresser to give a torn effect. Adhere on the first mat layer with foam tape. Cut a border in white card stock from the Eyelet borer basic die and adhere on the card front in the centre. Stamp the handstitched background image with embossing ink on vellum paper. Add white embossing powder and heat set with heat gun. Cut a stitched frame from white card stock and add the embossed vellum at the back. Adhere this to the card front with foam tape in the centre covering the border die at the base. Cut an eyelet frame rectangle in white card stock using the smaller dies. Cut a designer paper at its back with clear glue and adhere at the base of the card front as shown. Cut the Intricate Swirl lace frame in white card stock and just add a small piece of the frame on the top of the embossed stitched frame with clear glue. Add the insert of the lace frame die horizontally on the embossed frame die. Stamp the sentiment from Celebrate Love sentiment set on the oval insert of the frame. Add to the card front with foam tape. Stamp the images in different colours of majestic violet and vibrant fuchsia from the Patchwork Daisy cling stamp. Cut with matching die and color with the same colors. Stamp the flowers from buttons and blooms collection in red ink. Cut with coordinating die. Shape them on the flower making tool kit. Add buttons. Add glossy accents on the buttons. Stamp the leaves from the leafy accents cling stamp and cut with coordinating die. 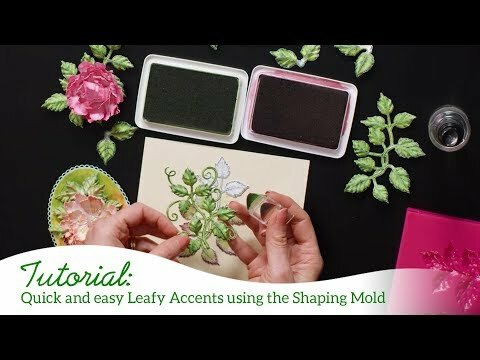 Shape them on the leafy accents mold. Add purple flower pearls to the smaller flowers. 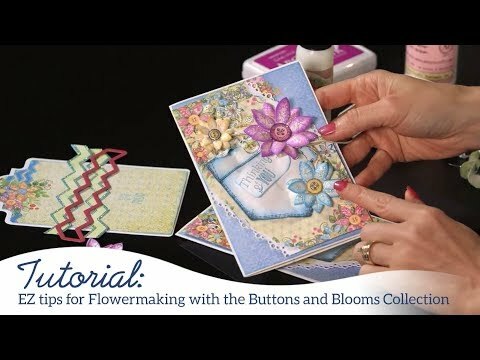 Arrange all of the flowers with the leaves on the card front to finish the card. Use small pieces of foam tape to pop up the flowers.